This DVD provides an introduction to surface materials in Maya for animators, visual effects artists, and game developers. Visual effects artists, Andrew Hazelden & Russell Hazelden, share countless tips and techniques that will help you create realistic surface materials. 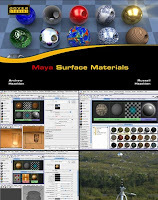 Maya: Surface Materials begins with an overview of the many render nodes available in the Hypershade. Essential topics include: exploring common material attributes, shading models, specular highlights, bump mapping, texture mapping, 3D projections, IPR rendering and raytracing.